Catherine Tate is far too talented and must be destroyed is how Dawn French described the newcomer after they appeared together in the short-lived BBC comedy series Wild West in 2002. Although not a particularly well-known face to television audiences at the time, Catherine had steadily been building her career as an actress and comedy performer for many years, having decided on a career as an actress while she was still at school. Born in London in 1968, Catherine was brought up by her mother and grandmother, her mother having left her father when Catherine was a baby. Catherine went to Notre Dame High School in Southwark and the Salesian College in Battersea before attending the Central School of Speech and Drama. Her talent for comedy eventually led to appearances in The Harry Hill Show and That Peter Kay Thing and to her becoming involved in Lee Mack s New Bits show at the Edinburgh Festival. A starring role in her own, sell-out, one-woman show in Edinburgh was followed by the offer of the role alongside Dawn French in Wild West. The Catherine Tate Show and the host of characters, from the argumentative teenager Lauren Cooper to the foul-mouthed Nan Taylor and the effete Derek Faye, along with their myriad catchphrases, quickly followed, establishing Catherine as a household name, although few of her comedy fans realize that she has also appeared in productions at The National Theatre and with The Royal Shakespeare Company. Catherine leads a very private life along with her partner, stage manager Twig Clark, and their young daughter, Erin. Laugh It Up! 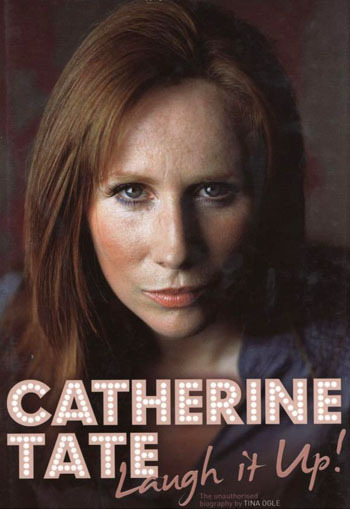 (catchphrase of her character Geordie Georgie) is the first major unauthorised biography of Catherine Tate, Tina Ogle drawing on numerous interviews and background material to build a true and complete portrait of this hugely talented performer. Tina Ogle is an author and journalist who has been writing about TV and TV stars for various publications, including The Independent, The Daily Mail and The Guardian, for almost twenty years. This is her first book for Carlton.